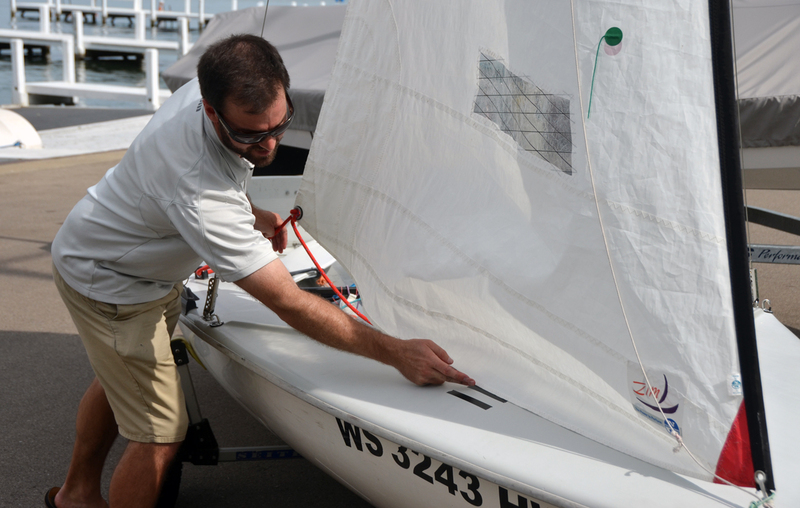 Follow along as John Pearce, US Sailing Youth Director, applies the Harken Blockheads tuning decal on a Club 420 to create fast, repeatable settings. A. 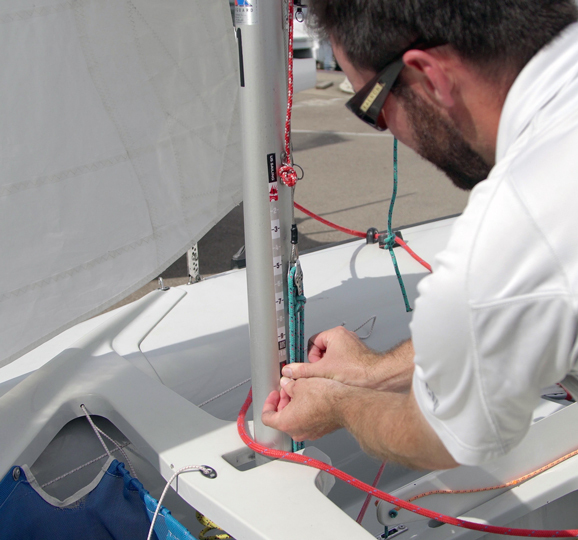 Tie a line to the jib tack pin. B. 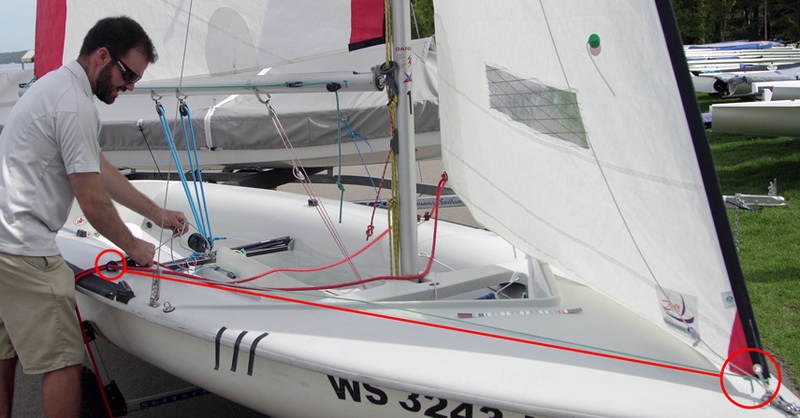 Bring the line back through the fairlead and cleat-off as if it were a jib sheet. This will give you the theoretical tightest trim angle the jib would see. C. On both sides of the boat, locate the point along your piece of line where the middle of the jib foot would be when trimmed. 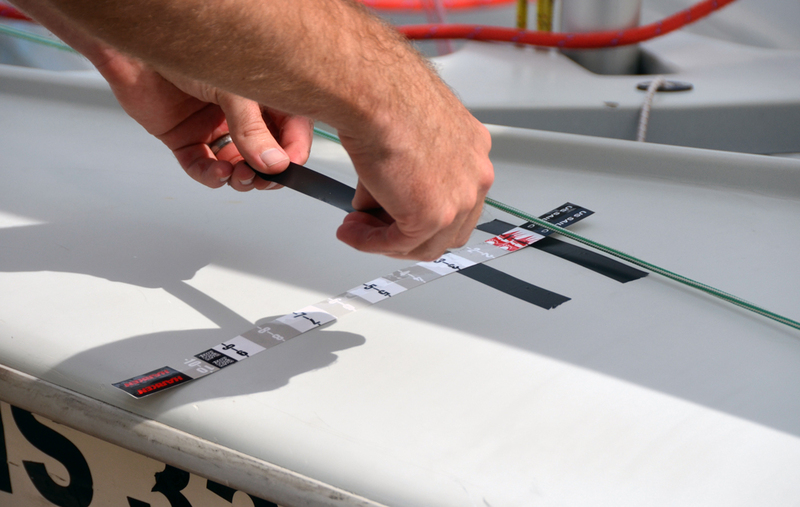 Place a strip of electrical tape on the deck, parallel and to the outside of the line. 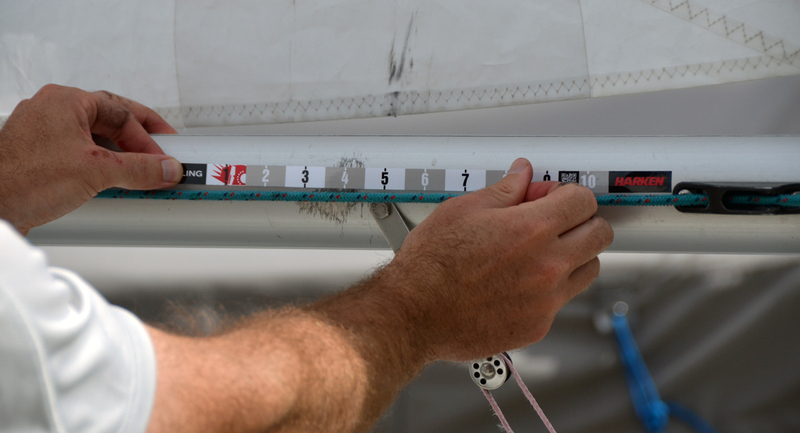 Using the tuning decal as a ruler, place it perpendicular to the tape so that the outside edge of the tape aligns with the number 1 mark on the decal. From here, place two more strips of electrical tape at the number 3 and number 5 marks, aligning the outside edges of each with the marks. 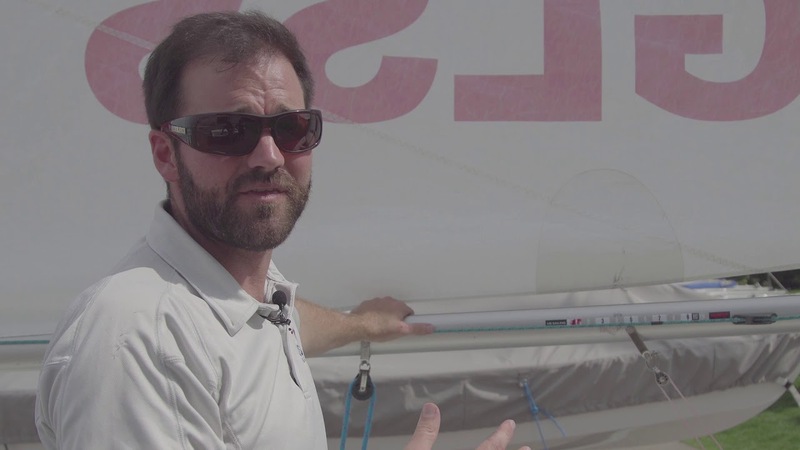 D. These three strips will help you to define baseline jib trim positions. A. Take the horizontal strip of the tuning decal and adhere it to the boom along the outhaul line just immediately aft of the outhaul cleat. B. Adjust the outhaul to roughly half-way between the max ease and max trim you would see. Using a marker or piece of tape, mark the outhaul line at the tuning decal’s number 5 mark. From here you can record settings as the outhaul is trimmed and eased, using the number 5 as your middle point. A. 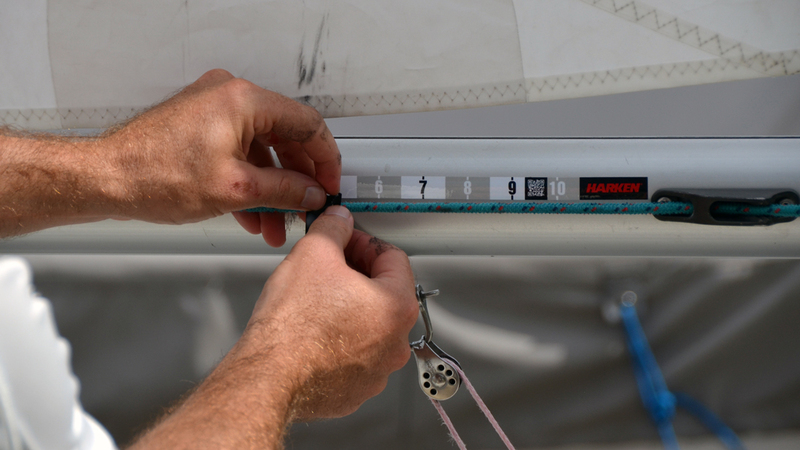 Using the vertical strip of the tuning decal, adhere it to the mast along the jib halyard purchase. 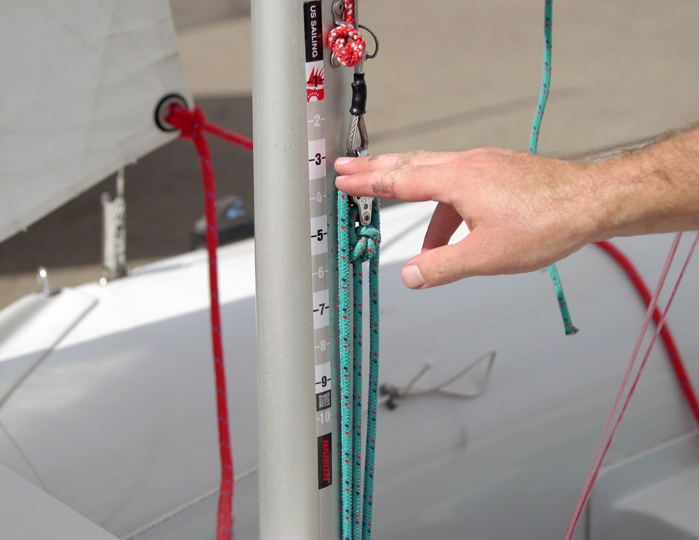 When doing this, set the jib halyard tension to medium and then place the decal so that the number five is right next to the top of the block. B. 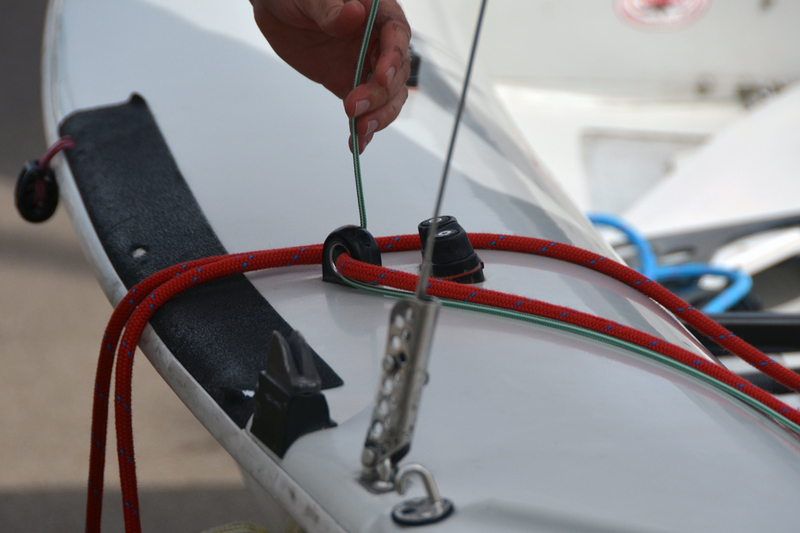 Using the top of the block as your marker, you can now record and repeat heavy and light jib halyard trim settings.